Cemetery records and map locations are maintained at Omro City Hall. 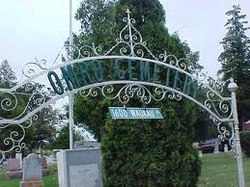 The Omro Cemetery is owned and maintained by the City of Omro for the benefit of all citizens. The City of Omro is profoundly aware of the great debt owed to those who have gone before us, who in love and sacrifice have entrusted the administration and care of this cemetery to our keeping. Therefore, it is only fitting that our cemetery be kept in the finest possible condition as a sign of respect and gratitude to our decedents. In order to facilitate administration and care of the cemetery, in extending everyone equal and fair treatment, maintaining uniform control as well as maintaining the serenity and natural beauty of our cemetery, rules and regulations have been established. These rules and regulations are designed for the protection of owners’ interment rights as a group. They are not intended to restrain, but to prevent, the inconsiderate from taking unfair advantage of others. Their enforcement will help protect the Omro Cemetery and preserve the grounds as a place of serene beauty for the after life. It is urged that lot owners interest themselves in the past and present care of their lots, as a single neglected lot mars the beauty of the entire cemetery. All flowers and decorations are to be removed on or before April 15th and or October 15th each year for a two week clean up period. New arrangements may be placed after the 1st of May and November. Any unsightly items that are not removed in a timely manner for the scheduled clean up periods will be removed at the discretion of the Cemetery Director.